For me, shooting is not about being aggressive, being tough, or even about protecting myself. I have recently likened target practice to "solving a hard Suduko puzzle". When I shoot a good grouping it makes me feel accomplished, capable & skilled. I started out shooting the smallest round available and have been slowly working my way up. Each time I try something new, and handle it well, I feel great. 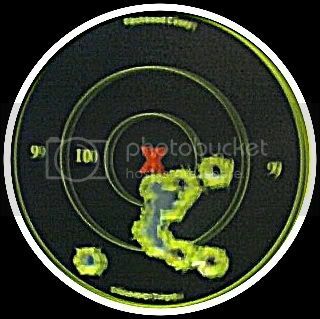 This is the grouping I achieved the first time I picked up a .40mm Glock, last week. As I've said, it's only been about 3 months since I started hitting the range regularly. I have heard it said that woman make better marksmen... What are your thoughts? How did the Glock feel? Was there a lot of recoil? I'd love to hear the details of your experience since the Glock 23 is what I want to buy. My first time in the range I tried the 38 special and a .45 1911 and I felt completely overwhelmed. Then I slowed things down and worked my way up from a .22 to a 9mm to a 45, spending a few weeks getting comfortable with each before moving up in caliber. It was at that point that the .40 was handed to me. I have to say, it felt good and I felt competent and in control. Glocks are great, reliable and easy to clean. There's a ton of them out there so it should be easy to find a used one in good condition, because as most experienced gun shoppers will tell you, buying used, is often better and cheaper than buying new.